The new Esri Training website provides a centralized location for geospatial learning. With the relaunch of the Esri Training website, you now have a centralized location for geospatial learning. Learning content produced by experts and teams across Esri is now accessible from a single place—esri.com/training. "Esri encourages lifelong learning," said Esri president Jack Dangermond during the 2016 Esri User Conference Plenary Session when he announced that all customers with a qualifying product that includes current maintenance would receive unlimited, free access to self-paced e-Learning through the new Training site. "We are happy to offer organizations the opportunity to train more people in their workforce in how to use ArcGIS at no additional cost." This easy access means that you and more people in your organization can take advantage of up-to-date, authoritative ArcGIS learning resources to acquire new technology skills, incorporate spatial thinking and problem solving in their work, and apply ArcGIS tools to gain location-enabled insight. Esri produces content designed to help users at all levels be productive with ArcGIS. Hundreds of learning resources support experienced GIS professionals, application developers, students, educators, people who are not GIS professionals but want to use the technology, and anyone interested in learning geospatial concepts and building ArcGIS skills. All content is professionally curated and vetted for currency. It ranges from a variety of self-paced presentations, courses, exercises, and books to MOOCs (massive open online courses) and instructor-led classes. This variety of formats supports different learning styles, schedules, and preferences. Self-paced e-Learning options can last from one to three hours, while instructor-led courses can last from four hours to five days. MOOCs, which have become extremely popular with working professionals, blend the instructor-led and self-paced learning experiences. Over four to six weeks, MOOC students watch video lectures; work through hands-on software exercises; and participate in lively, moderated discussion forums. The Training site simplifies content discovery. You don't have to visit multiple sites to access all the learning resources Esri provides. While many Esri Press books, Learn ArcGIS lessons, E380 videos, MOOCs, and educator resources (including GeoInquiries, Mapping Our World lessons, and SpatiaLAB hands-on activities) are still available from individual Esri web pages, they have also been curated into the Training catalog to provide you with "one-stop learning." Given all the learning resources available, you may want some guidance. Learning plans are a new way to jump-start understanding and get hands-on experience applying ArcGIS to a focused topic or workflow. A learning plan contains a set of sequenced learning options, typically a mix of web courses; seminars; videos; Learn ArcGIS lessons; and, in some cases, instructor-led courses. 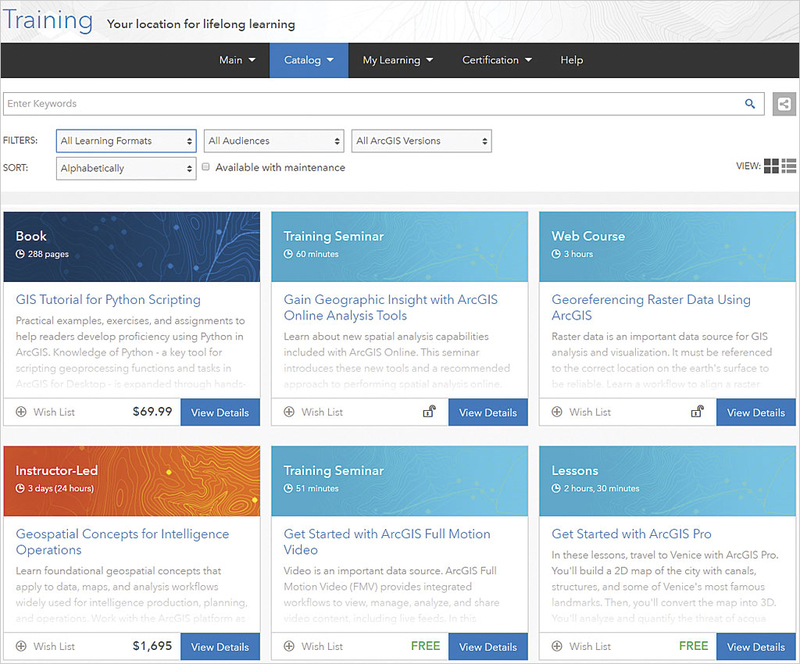 Spatial analysis, ArcGIS Online administration, mapping, and more topics are available as learning plans that can be accessed by filtering the Training catalog. For decades, Esri has realized the value of education and has been a leader in customer training. Early on, Esri developed instructor-led training courses. This was followed by the founding of Esri Press and the creation of the Virtual Campus, the Esri Technical Certification Program, MOOCs, and many popular K–12 and higher education programs. These investments have helped forge the dynamic and thriving user community of today. Working professionals must continually build their skills and adapt to new workflows in this rapidly developing technology. 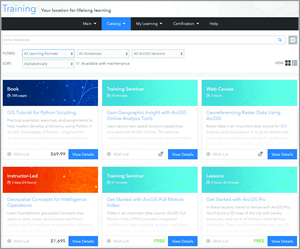 The Training site was redesigned with lifelong learning in mind. New content is added regularly, and the learning environment is engaging and dynamic. Individuals can explore and have fun as they continually grow their geospatial knowledge and technology skills. The open access model for self-paced e-Learning allows you to freely move from course to course and develop new skills as needed. You can find a course in the Training catalog and immediately start learning. To explore the curated collection of ArcGIS learning resources, visit esri.com/training.